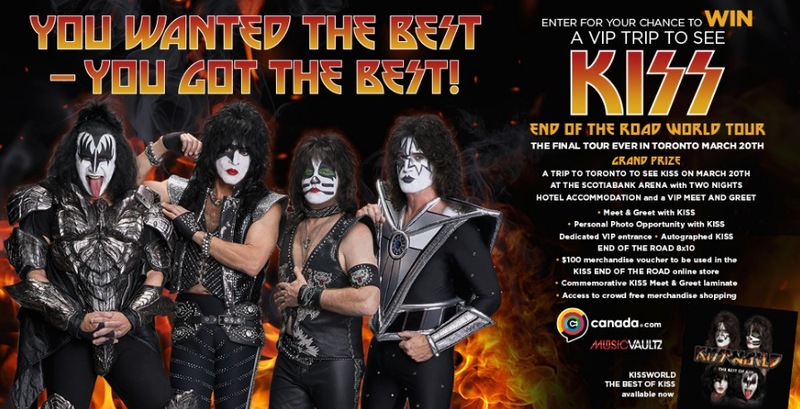 Enter the Canada.com Kiss Contest to get a chance to Win a VIP trip to see Kiss including a meet and greet in Toronto. This contest is open to all legal residents of Canada who are of the age of majority or older in their province or territory of residence. To enter you just have to visit the official contest web page and complete the online entry form with your name, last name, age, email address, phone number, address, city, province and postal code. Contest ends at 10:00 am ET on February 28, 2019. Winner will be selected at random from all eligible entries. The Canada.com Kiss Contest begins at 10:00 a.m. ET on January 18, 2019 and ends at 10:00 a.m. ET on February 28, 2019. The draw will take place on February 28, 2019. Winner will be notified by phone or email.